C.W. was devastated. If you have ever seen an alien on the verge of tears, it is not a pretty site. Here is what happened. With some misgiving, we had invited him to go with us to the Sunflower River Blues and Gospel Festival in Clarksdale, Mississippi. As everyone knows, this is the town where legendary bluesman Robert Johnson sold his soul to the Devil in return for becoming a guitar playing phenomenon. C.W. has always been fascinated by this legend despite his understanding that it is only one of the minor myths of both music and religion. Anyhow. He had never been to this festival and I hesitated. Loyal readers will remember his antics, appearing as Elvis and distracting the crowd, at another show a couple of years back. But, he prevailed and showed up as a sort of energetic version of Neil Young, the singer. He had long gray hair, a tie-died shirt, and a worn straw hat. He climbed in and off we went. Not this year. Our normal route to the festival area was blocked by temporary fencing. Forced to squeeze through a small entry point, under the gaze of some jack-booted security guards with bellies as big as Texas lies, we beheld a remarkable site. The entire area in front of the stage had been cordoned off and filled with tables, each with white cloth and flower arrangements. It belonged to the major donors to the festival who were the only ones allowed within sight of the performers. At a blues festival, for Christ’s sake. The “poor folks” made do with a seating area off to the side where the band members were a distant blur. Worst, for C.W. anyway, there was no area for dancing. “Well, the state has gone Republican,” I joked. 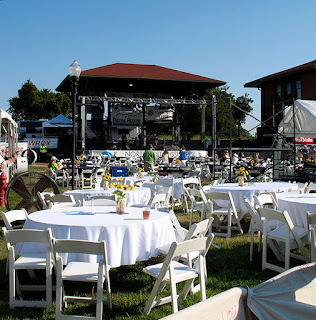 Want to know how to ruin a blues festival? It was even worse. Only four of five of the tables were occupied. The bands were literally performing to an empty space. Off to the side, in the distance, were the folks such as us, who had traveled there to see the show. “If this don’t beat all,” said C.W., beginning the Falloonian version of a pout. Then the whole place erupted with music and a group of young ladies strolled by wearing, among them, maybe a yard and a half of clothing. “Later man,” he said. “Got to go see what my soul is worth.” And he was gone.